The Uniden® Solara marine radio covers all US, International and Canadian marine channels, keeping you up-to-date with all the latest marine activity. It offers DSC capability including distress and individual calling and offer N.O.A.A. weather channels. 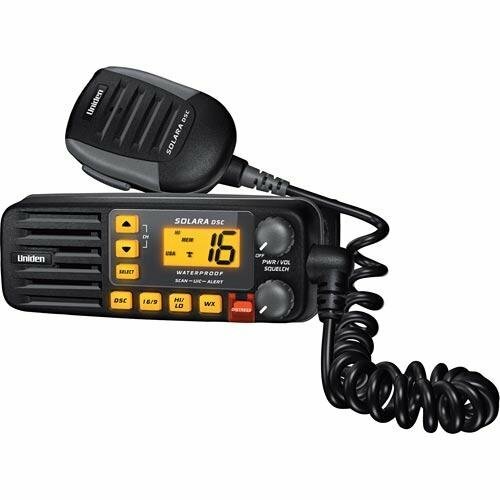 Radio Frequencies: VHF--Very High Frequency radios that are not intended for land use and can only be used on the water. . Programmable Scan Feature--Allows you to scan for available channels.. LCD Display--Clear and easy-to-read display. .
Screen Backlight--Brightens display for easy reading in low-light conditions.. NOAA Weather Station--Feature that gives you weather alerts for possible storms in the area.. Power Output: 25 Watts. Number of Units: Comes as One Unit.